Going Stag: Do You Race Alone? I had a conversation with Cinnamon recently about racing alone. She mentioned that, being single, she looks around at the end of races to folks reuniting with their cheering squads after the finish line and feels a little bit left out, like everyone has someone there except for her. I know she’s not alone in feeling that way and she’s also not alone in racing on her own. Loyal Salty followers, let me assure you – if you cross the finish line with no one cheering for you except Pat Benatar in your headphones, if you go through the chute and pick up your oranges, bagels, bananas and beer with no one to share them with, if you visit the schwag tents by yourself and slip free Kind bars into your pockets for later, and then get into your car to drive yourself home … you are not alone! Even the great Salty races by herself. 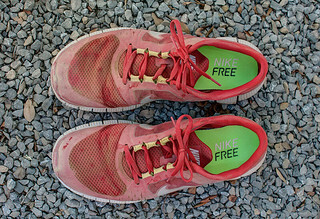 I became serious-ish about running again at the end of 2012. I found a fun, last minute end-of-the-world 5K (you remember when the Mayan calendar ran out, right?) that I signed up for on-site race morning. I was just doing it for fun, and I didn’t ask anyone to go with me. I placed in my age group, for the first time ever, on very little training, and it got me to wondering what I could really do. What you don’t need to know is that this was a poorly advertised race that couldn’t have had more than a hundred runners, or that it took me longer than 25 minutes to run it. All that mattered was that I placed, and that was pretty damn cool. Fast forward to February 2012. I had signed up for a ten mile trail race, promptly injured myself while training for it, and dropped down to the 10K option. The first five of each gender got awards. I was the sixth female to finish the 10K. On very little to no training since I injured myself, and still with enough of the injury lingering to make me wondering how big of a mistake it was to run at all. Yep, I’ll take sixth! Guess who was there to cheer for me at the finish line…no one. There was also no one at the finish line for the various little 5Ks I did last year, Bastrop 10K, the Uptown Classic, the Rogue 30K, the 3M Half, or the other races in the Distance Challenge (except for one). You know what? That was okay with me. I am a very selfish runner – I wasn’t running for anyone else, I was running just for me. I was nervous about running the 30K alone, not because I necessarily needed someone to be there, but because I wasn’t sure my legs would drive me home after that distance, with it being my longest race to date at the time. I had to hang around the venue for an hour afterwards to get my legs to agree to take me home without twitching and cramping up. Which was, quite honestly, one of the biggest reasons I asked my husband to show up to the end of my marathon. Here’s the thing about my husband, and our marriage: we’re both pretty damn happy. We’ve been through hard times, just like any marriage out there, but right now we are at a place in our relationship where we are calm, confident, best friends who think the world of one another. Either of us would be hard pressed to find meaningful existence without the other, but, we both pursue our own passions, in our own way. I’ve mentioned before that my husband is a fisherman. He’s really not bad! He’s been on (and hosted) fishing radio shows, been in fishing tournaments on national TV, been featured in articles and on the covers of fishing magazines. For a guy that has a day job and two kids, and only makes it out of the house to fish once or twice a week, he’s doing pretty well! Put that in perspective: imagine you were only able to get out and run once or twice per week. Here’s the thing…I rarely go to his fishing tournaments. I’ll go if the tournaments are hosted at an exceptionally pretty place, and if the kids don’t have soccer games, and if I don’t have a race, and if I really want to camp out or get up at 2:00 AM to get there on time. If all of those respective stars don’t align – he’s on his own. If the race doesn’t go as planned, you’re less likely to mope about it if no one is there to see you. You’re not obligated to listen to anyone else mope about their race. You can wait for your turn at the massage table without feeling like you’re making someone hang around and wait for you if they may have other things to do. You can visit the portalet as many times as you want – shamelessly! I have no idea who this woman is. We finished a race neck and neck and I cheered and yelled at her, then we took pictures together at the end. Never would have happened if I wasn’t there by myself! Seriously, are you really going to tell your cheering squad, “Hey guys, hold on a moment, I want to go talk to this person who I’ve never met and may never see again, just because!” I made friends with a super sweet older couple at one of my races, who I never would have sat down next to if I had a companion there with me. They had fascinating stories, and they were super duper sweet…they even cheered (loudly) for me when my name was called as an age-group winner. Something similar happened at the Bastrop 10K, when I was first asked my age by a girl who wanted to make sure I wasn’t competition for her. So, friends, YES, it’s great to have folks there to support you and cheer you on, and drive you home. But, most days, it’s also great not to. Salties, what do you love and hate about racing alone? I’ve actually never went to a race alone! I’ve always had someone there, either to spectate or to run with me. I’ve told my family I don’t want them to come with me to any of my 3 races this season. I just want to be able to focus on myself – which I totally can’t do with 3 kids in tow. However, I’m hoping to do some fun runs with my older son and my husband, and of course for those it will be great to have a crowd of family along! I just read the post you linked about me racing alone and for some reason it says I wrote it, but it was actually Mace. I was reading it and wondering if Cinnamon edited it or something because it didn’t sound at all like me and I couldn’t remember writing it! Ha! But, I have raced alone. I met my first running friends at races I went to alone. However, I’ve been around here long enough that now I always know somebody at a race, so I don’t feel completely alone. I think it’s totally fine. If you want to race and no one wants to go or you want some peaceful you time, then go for it! Oh, and definitely use it as an opportunity to meet new people. Like Salty, I met a lot of my current running buddies by heading to races alone. I don’t mind at all – particularly local races where now I’ll no doubt run into several people I know. Usually my husband comes to my goal marathons (sometimes kids too depending on where it is and what the logistics are), but I also have no qualms about driving a state or 2 over on my on to race. There are ups and downs to both. I’d definitely prefer to have them there to share the experience, but I don’t mind going it alone when it doesn’t fit in everyone else’s schedules. I usually run races where other people I know are also racing and we meet up afterward and congratulate one another. But last October was the first time I ever had anyone in the crowd cheering me on. It was unexpectedly thrilling and kinda emotional to suddenly have someone you recognize pop into view, holding a sign for you, and screaming your name! It honestly got me so psyched and kinda really emotional that I wanted to hug them, jump for joy, – I was feeling pretty damn special in that moment. As a college student with very few friends that enjoy running as much as me, I’ve gone to a couple halfs, 5ks, and 10ks by myself. I enjoy being able to hang around as long or as short as i want, and I usually meet other students from around the area that ran solo! My friend Joan is the best person to bring to a race and she has come to all 31 races. I don’t have runner friends (Joan runs a bit) and I enjoy the energy of a race. When she sees me coming to the finish line she yells my name and has joked about getting a cowbell. We hang out for a bit afterwards and then maybe go shopping or for a coffee and talk about the race. Much as I love having a friend or my family at the finish line, I actually really enjoy racing alone. I get to listen to my own awful music on the way, get myself organized once I get there and then eat as many oreos from the snack table afterwards as I want. I don’t get lonely at all. I feel bad for asking my husband and son to come to races, it’s not much fun for them in general. But they do come for important races and seeing them at the end is always wonderful. And my best ever experience was running a half marathon in wine country on ‘open roads’ so they got to cycle from mile-marker to mile-marker ahead of me and cheer. That was pretty special! I do most of my races stag. My husband doesn’t get the point of showing up (separate hobbies). I recently started racing with my running buddies and I realized I don’t actually enjoy the race as much. I pace in my own weird way and I don’t like the pressure to run with someone or even near them. However, post race is much more enjoyable with company.